Community tracks are awesome – anyone can use them, pretty much any time, for free. YAY running! This does, however, open up the possibilities of who you might find yourself running next to. 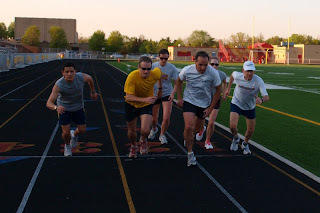 It could be a group of beginner run-walk-runners doing a couple laps, or a professional marathoner doing an intense interval workout. The pro probably knows the ins and outs of track etiquette, while the track tyros* are less likely to be aware. No matter which category you fall into, an etiquette reminder never hurt anyone, so read on! The track is a shared space so consideration for others is key. Runners can get really intense about their workouts, but remember it’s just a run…it’s supposed to be fun! What lane should you use? 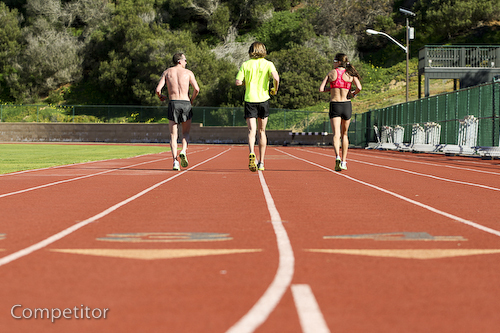 Every runner has the right to use lane 1, no matter how fast or slow they are. However, if you’re running a workout, it’s a bit questionable to do your between-interval shuffle/jog recoveries in the first lane. Walkers and run-walkers should use the outside lanes. If someone is in your way and does not belong in lane 1 (i.e. a walker, or a stray soccer/lacrosse/ultimate frisbee player wandering off the infield), call Track! to let them know you’re coming and they should move to the second lane. In an ideal world, the person moves to lane 2, you gasp a thank you, and everyone continues on their way - happy and unscathed. Unfortunately, more often you call Track! Track! TRACK!!!! and nobody moves. Hopefully they get the idea as you blow by them…but maybe they won’t. 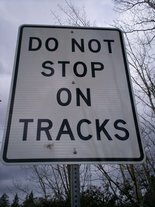 Clearly they haven’t read about track etiquette, so try not to vituperate* anyone - be polite. If you see them as you’re jogging your recovery, try a, “Excuse me, if you’re walking, do you mind moving to lane 2?” But use your best judgment here…it could be a lost cause. Take this scenario for example. You’re running fast and catching up to someone running in lane 1 (remember, they have a right to be there – do not yell Track!). To pass, move to lane 2 and give them plenty of space. Don’t move into lane 1 immediately after passing (i.e. don’t cut people off). If you’re feeling particularly polite, you could call out an On your right! in a non-strident* tone of voice (but you don’t have to). Funny story: My mama used to say “Excuse me!” every time she passed someone. In races! I could write a novel on this subject…but I’ll keep it brief for now. It can be summed up pretty easily: workouts are not races. Don’t sprint at the end to beat your workout partner by a nose. Don’t run wide to prevent them from passing. Don’t sprint to pass them and then slow down. The beauty of having a teammate/running buddy is that you can work together. It’s easier to follow than lead, so don’t make your friend do all the work. Take turns leading each interval, and in tempo runs, switch leads every couple laps. Wait until there's a break in the flow of running traffic to jump in and start your run. 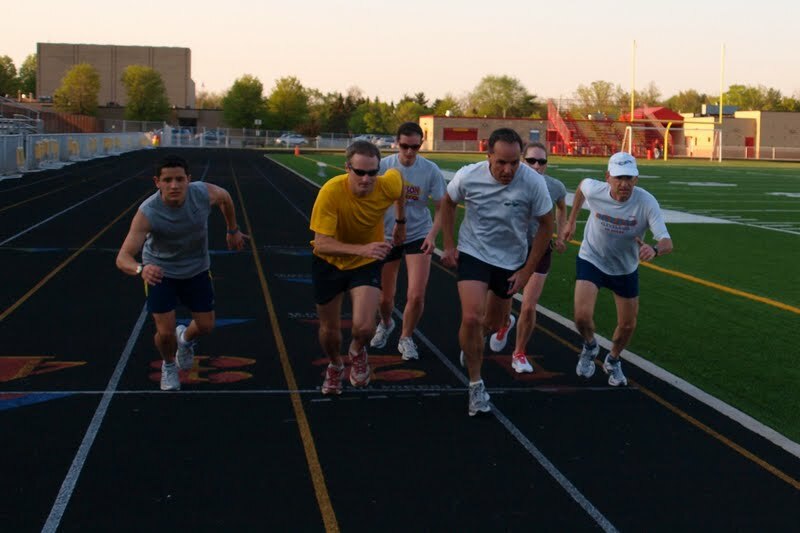 If someone is running fast and you know you'll be slower, wait until they pass to start. As you approach the finish line of your run/repeat/tempo, try to be aware of those around you. When you cross the line, don’t just stop (or sit, or pass out, or lie down in the middle of the track). Move out of the way immediately (your best bet is usually to jump to the infield), in case there’s someone behind you who plans to continue running. Run counter-clockwise. If you're running clockwise, use the far outside lanes. Don't use earphones on the track. There are too many people in a small area with too many opportunities for collision...you should be aware. It's never a bad idea to support your fellow runners - say "good job!" as you pass/are passed. Everyone needs some encouragement! *Tyro - n. a beginner in learning anything; novice.